On this Ecuador vacation package, you will discover the Andean capitals of this breathtaking country. From the tropical weather of Guayaquil, to the colonial ambiance of Cuenca, and finally to the staggering heights of Quito’s surrounding volcanoes, you will see all of the country’s highlights on this Ecuador vacation. A trip to Cuenca, Ecuador’s most picturesque city, will transport you into the colonial history of the country. It is truly a delight to stroll down the cobblestone streets and admire the beautiful marble buildings and leafy plazas of this attractive city. This UNESCO World Heritage Site is also known as the “Athens of Ecuador” due to its long tradition as the birthplace of notable artists, writers, and philosophers. Continue on your Ecuador vacation and discover Quito, another colonial gem set deep in a hollow at the foot of Volcano Pichincha and the second highest capital in Latin America. Located at a towering height of 9,200 feet (2,800 meters), this a former capital of the Inca world is a treasure of history. Its historic center, known as the “Old City”, is full of steep paved streets, indigenous vendors, and discrete doorways leading to expansive flower-filled courtyards. In the modern part of Quito, or the “New City”, travelers will take a break from history and dive into the dynamic and trendy district of Mariscal Sucre, with its countless restaurants, bars, and shops. It only takes a few minutes for Quito’s cable car to transport you to over 13,000 feet above sea level where you will be able to admire the impressive surrounding volcanoes while overlooking the city. You will be met at the Guayaquil airport by a Galapagos For Less representative who will take you to your comfortable Guayaquil hotel. You will have the remainder of the day to relax at your hotel or explore Guayaquil at your leisure. Your exploration of Ecuador continues with a journey toward Cuenca, stopping at the lovely Cajas National Park along the way. The National Park is located about 18 miles (30 kilometers) northwest of Cuenca. The tour and transfer today will take between 6 and 7 hours. With over 250 lakes and ponds spread across landscapes varying from desolate, lunar-looking terrain to lush cloud forest, the park offers various activities that will meet the desires of each and every traveler. You can choose between hiking, fishing, bird-watching, observing the rich and colorful flora and fauna, and more. You may also visit the Interpretation Center close to La Toreadora Lake - the largest lake in the park - where pictures and presentations of the reserve are displayed. Later, you will continue on toward Cuenca, where you will check in to your confirmed hotel. You will have the remainder of the day to spend at your leisure resting at your hotel, or exploring Cuenca and its lively nightlife on your own. Although Cuenca is Ecuador's third largest city, it still retains its pleasant provincial air. Today you will enjoy a Cuenca tour to discover the beauty and charm for which Cuenca has been recognized as a World Cultural Heritage Site. This walking tour in the colonial downtown area of Cuenca will allow you to delight in the warmth and hospitality of its people, the colorful parks and plazas, religious monuments, and handicraft shops while learning about the city’s history. In the afternoon, you will visit a workshop where some of the highest-quality Panama hats are made. Cuenca is one of the largest producers of the famous and classically elegant Panama hat. You will then enjoy a drive to Turi Hill for spectacular views of the city and countryside. In the evening, you will be free to explore Cuenca on your own. Complete your Ecuador vacation by tasting the delicious regional cuisine in one of the many restaurants downtown, or rest at your comfortable Cuenca hotel. After breakfast you will be transferred to the Cuenca Airport for your flight to Quito, the next destination on your Ecuador vacation. Upon arrival, you will be picked up from the airport and taken to your comfortable Quito hotel. The transfer time from the Quito airport to most hotels is between 1 hour and 1 hour and 30 minutes. Once you are settled in, you will start your full-day Quito City Tour and Mitad del Mundo Tour. The Quito City Tour will take you into the historic center, a UNESCO World Heritage Site, where you will enjoy panoramic views of Alamada Park and the Basilica, and stroll down the Street of the Seven Crosses (Garcia Moreno) named for the seven stone crosses the Spanish built there after conquering the city. You will also visit the Plaza Grande, also known as Independence Square, which is surrounded by some of the most exquisite buildings in Ecuador, such as the Presidential Palace and the famous La Compañia de Jesus. Lastly, you will visit Plaza de San Francisco, renowned for its spectacular setting in the shadow of Volcano Pichincha, where you will tour the San Francisco Church and Monastery. Next on the tour, the Mitad del Mundo (Middle of the World), about 45 minutes outside Quito, where the Equatorial Monument stands. The monument marks the place where a French expedition located the equator in the 17th century. Here you will visit the interactive Intiñan Solar Museum and learn more about the historical and modern science behind determining the location of the equator. At the end of the tour, you will return to your Quito hotel and spend the evening at your leisure. After breakfast, you have the opportunity to take an additional Quito tour, or meet your transfer to the airport for your journey home or to the next destination on your Ecuador vacation. 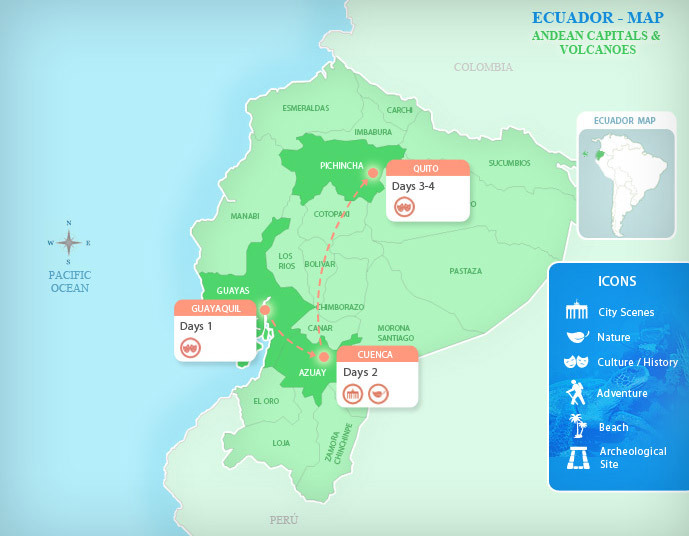 Browse our Ecuador vacation destinations for ideas of where to head next. This new, modern hotel in Guayaquil offers guests everything expected of a five star hotel. Each of the 144 rooms is spacious, furnished with comfortable beds and luxury linens, and well-appointed with large work desks, a coffee maker, and cable television. Wireless Internet throughout the hotel, complimentary parking, and a complete business center make this hotel particularly attractive to guests who need to stay connected to home on their Ecuador vacation. Enjoy Mediterranean cuisine in the elegant on-site restaurant, de-stress in the fitness center, or take a dip in the refreshing pool before exploring all that Guayaquil, the entertainment capital of Ecuador, has to offer. In the evenings, guests can enjoy a cocktail at the trendy bar, relax in the library, or head out on the town to explore Guayaquil's exciting nightlife. Directly next to the largest cathedral in Guayaquil, the Grand Hotel Guayaquil is only 15 minutes from the airport and minutes from the Malecon de Rio Guayas, a broad riverfront boulevard home to many of Guayaquil's most exciting attractions. The hotel's charming inner courtyard features a cozy pool, waterfall, and lush climbing garden. Each of the 182 rooms is tastefully decorated, generous in size, and fully-equipped. Dine on both national and international cuisine in the on-site restaurants. One of the best features of this hotel is the 7,000 sq ft rooftop gym which offers squash courts, aerobics, and training equipment. If you would prefer to just relax, head to the spa for a steam bath and massage. Tangara Guest House is a Bed and Breakfast located near the Malecon del Salado and close to Guayaquil’s downtown, tourist areas, and the airport. With its friendly staff and peaceful environment, guests will enjoy their stay in this homey Guayaquil hotel. Those craving social interaction with other guests can make use of the living room, dining room, garden patio, and kitchen area. Rooms are equipped with private bathrooms, air conditioning, how water, cable TV, and access to wireless internet. This 5-star luxury hotel is conveniently located only 20 minutes from the Quito airport and a 10-minute walk from the city's historic center. This fully equipped and elegant hotel is perfect if you are looking to pamper yourself and enjoy a carefree vacation. Relax in the fitness center, spa, or swimming pool, and treat yourself to a delicious meal in one of the hotel's five exquisite restaurants, or simply rest in your modern and luxurious room. All rooms and suites are stylishly decorated in a contemporary fashion and provide spacious areas for you to relax in style. This new luxury boutique hotel is probably one of the best hotels in all of Ecuador. This elegant hotel successfully combines contemporary and traditional Ecuadorian styles, giving it an air of authenticity while offering great comfort and stylish décor. As a reminder of the city's fascinating and complex history, each room is uniquely decorated to emphasize different elements of Ecuador's cultural heritage. The hotel's architecture, however, focuses on simplicity with a carved wood and stone center bringing an air of serenity to the entire place. Enjoy instant relaxation in the hotel's wellness zone equipped with a Jacuzzi, hammam, and massage room. Located in Quito's newest commercial district and inside a majestic renovated colonial house, the Hotel Vieja Cuba comprises 26 rooms offering all the amenities that comfortable modern life requires. The stylish rooms, equipped with wooden furnishings and warm colors, are cozy and create a peaceful haven where guests can rest after a long day of sightseeing. The three restaurants and the coffee-bar are all characterized by the distinctive touch of the various chefs who manage to exquisitely combine African, French, Spanish and Chinese influences into a delicious Cuban gastronomy. After breakfast at your hotel, you will head to the Guayaquil Historical Park, one of the biggest parks in the country. The park offers travelers an opportunity to learn more about the culture, history, and traditions of the city. There are three main parts to the park: the Traditions Zone, the Wildlife Zone, and the Urban Architectural Zone, each covering approximately 19 acres (8 hectares). The Wildlife Zone gives you the chance to observe various species of animals and learn more about the flora and fauna of the area. Many of the foot paths in this part of the park are raised above ground to avoid damage to the unique local plant life. In the Traditions Zone you will experience life in coastal Ecuador, where in many communities families still live in homes made of bamboo. Here you will see the native rural architecture of the Montubio people, as well as their traditional labor instruments, clothing, household items, and more. Finally, in the Urban Architectural Zone, you will learn about Guayaquil's construction boom that took place in the early twentieth century. Included: Transport to/from the park, English-speaking guide, entrance tickets to the park. *Note: Prices are per person and based on a private tour with a minimum of two travelers. For single traveler options, please consult with a Travel Advisor.